I took a guess earlier, but I plugged in some actual numbers - UP's RPI was .4401 (240th) heading into tonight. Their RPI will improve to .4855 with a Washington win over Long Beach State tonight, or to .4813 with a LBSU win. This matters because we share a common opponent with UW (they gave SJSU the business last night). Should push the Pilots up around 60 spots to around the 180s. Hey, getting a little ahead of myself here, but who was the Pilot's next home opponent after they broke into the Top 25 in 2009? Agreed. The scheduling for the tourney is playing out well... I would hope that we would be able to use a lot more of the bench tomorrow, and then probably shorten up again on Sunday... after which the guys have a couple days and nights in their own beds to recover for PSU. Let us not forget that our opponents will also have played game(s) back to back. Yeah, I was thinking the same thing when I discovered that PSU is also undefeated (so far) this year. One game at a time! Mrs. DD exclaimed, "Oh no, we have to play PSU next Wednesday?!!" Drake....a wonderful coach in Ray Giacoletti, but losers to Bowling Green, De Paul, and Western Michigan before defeating IUPUI and losing to Valpo. KenPom rated at 287 with an RPI of 255, just behind UP's 240 (but the RPI does NOT include Friday's games in Nashville). UP is now up to 109 on KenPom's scale and UP is favored to win by 8. Interestingly, Las Vegas is apparently not offering a line on this game...maybe a 3PM game is too early for the punters. I like those highlights! Bobby Sharp, Bobby Sharp, Bobby Sharp. I did not realize Giacoletti was their coach... he is a great coach and a good guy. I see this is his 2nd season with the Bulldogs... any team with him as coach is going to be tough! Drake is private, secular and located in Des Moines, IA, with an undergraduate enrollment of 3,300. Murray State has some highlights up. They look different. Good to see Fr. Gerry (back to camera) was able to make the trip....always good see a familiar face (besides your teammates and staff) when away for the holidays. Yes, the Barkers are in Nashville also....should be about 30 degrees warmer in Nashville compared to Vancouver, BC. Alright guys, no let-up against Drake today. Sure, there's only 20 hours between last night's game and today's, but think of all the all-nighters you've pulled and aced your exam the next day. You can sleep after next Saturday's game against Oregon State. DoubleDipper wrote: Alright guys, no let-up against Drake today. Sure, there's only 20 hours between last night's game and today's, but think of all the all-nighters you've pulled and aced your exam the next day. You can sleep after next Saturday's game against Oregon State. Well said! I expect that a few more guys will see minutes tonight, above the 7 players who got into the game last night. Probably Gabe Taylor, and perhaps Tyson. Speaking of which, I don't recall a Pilots game in which this few players saw the floor. I like the coaching staff's aggressive approach so far this season! Um....is that the Drake University Bulldog that Wally just ate? UP is hurt by it's poor strength of schedule: 337/349 (Only D1 games are considered). Las Vegas finally came up with a line on today's game....Pilots by 9. UP needs to be effective in the paint today....I look for Gabe Taylor to get some good minutes. Anybody find a stat feed that works for the drake game? Nine Pilots scored in the 1st half; only 5 scored last night in the entire game. 15 points off the bench, and 23 from the starters at half time, for a 16 point lead. 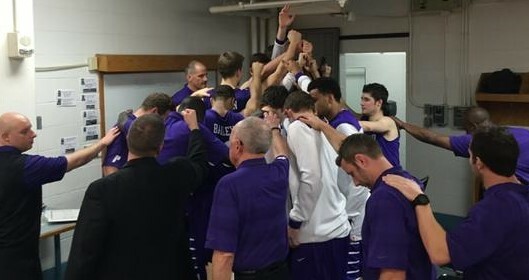 Pilots win their 2nd game at the tourney, 71-50. Good job, coaches, getting a lot of subs in the game while still securing the victory. Now, let's see Murray St. battle Valpo tough. The plan to use the bench Rev talked about worked. Everyone played. All but one scored. Let's hope Valpo has to play a short bench. Only 18 minutes for KB, and under 25 minutes for all starters except Alec (28 min). Another solid win for the Pilots...but looks like it's going to be the sternest test of the year coming up tomorrow. Valpo's 6-9 PF Alec Peters has 26 & 8 already an the Crusaders are up by 18 over Murray State midway through the second half. DeanMurdoch wrote: Another solid win for the Pilots...but looks like it's going to be the sternest test of the year coming up tomorrow. Valpo's 6-9 PF Alec Peters has 26 & 8 already an the Crusaders are up by 18 over Murray State midway through the second half. Yeah I saw that.....something strange going on there. Murray St. was leading by 6 at the half, but has been outscored 33-5 in the second half with 10 minutes to go. DoubleDipper wrote: Murray St. was leading by 6 at the half, but has been outscored 33-5 in the second half with 10 minutes to go. It was Valpo up six at the half. The two logos on the live stats are switched, maybe that screwed you up like it did for me at first! Hmm, I'm not looking at the stats, but at two different sources that provide scores....both are showing Murray St. up be 6 at the half, and now being outscored by Valpo 46-11 in the second half with under 4 minutes to play. Did the coach take everyone out of the game? Still a second half collapse.